Whether your basement is flooded – whether from a broken water pipe, sewage backup or storm – Aaron’s Restoration is prepared to react quickly to remove water, minimize damage and restore your property. Our crews are on-call 24/7 because rapid response is critical to prevent secondary water damage like mold, fungi or microbial contamination in your flooded basement or home. In addition to visible water in your flooded basement, unseen water can cause unseen structural problems as it seeps into the foundation, walls, framing and other structural areas. Prolonged exposure to water can also weaken cement foundations, crack open fissures and swell wooden framing, causing warping. So rapid, expert help is necessary to salvage what can be saved and eliminate the possibility of health hazards. We use the latest technologies in removing water, drying and controlling the humidity in your damaged home or business. Unless humidity is properly managed additional damage may occur to items within the building and to the structure itself. Structures that are not dried out quickly and properly can also become a feeding ground for mold growth. Aaron’s Restoration uses state-of-the-art powerful pumping methods and vacuum technology to remove water from all floors, including wood, carpet, tile, vinyl or cement. Then we thoroughly dry all exposed surfaces areas, salvage what can be saved and remove all materials that may have been damaged beyond repair. We also safely and properly disposal of any contaminated materials. 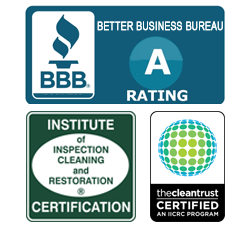 Our basement flood technicians are fully trained and certified by the Institute of Inspection, Cleaning and Restoration Certification (IICRC). 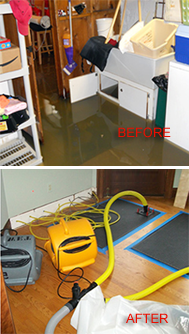 Our goal is to restore a home or business that has experienced basement flooding or other water damage back to its original condition as quickly as possible, while ensuring the work is done thoroughly and completely. Remove furniture from affected area, especially if you have a flooded basement. Providing flooded basement cleanup services to all of Southeast Michigan and the surrounding area including: Wayne, Macomb & Oakland County.